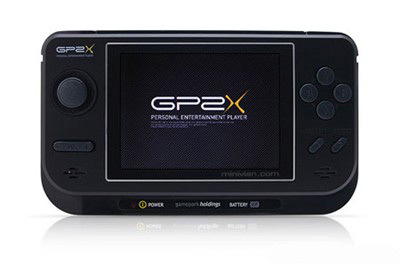 GP2X Personal Entertainment Player from GamePark Holdings is an open source Linux-based handheld portable games console and media player. GP2X-F100 improves on GP32 functionality and features. GP2X F100 powered by 240 MHz Dual Core ARM920T, ARM940T processor, 64MB RAM, 64 MB NAND internal memory, 3.5″ TFT LCD 320×240 (QVGA screen) and TV-out port to support homebrew and emulation developers. Beside been a gaming console that supports various emulation, GP2X is also a portable multimedia player or portable MP3 player. It’s versatile media players that supports for movies, audio, photos, and e-books. The movie player supports DivX, Xvid and MPEG-4 files, the audio player supports MP3 and OGG files complete with full equalizers and adjustments, the image viewer is compatible with JPG, PNG, GIF, PCX and BMP files with lots of options such as zoom. MaxConsole reviewed GP2X-F100 console and concluded that GamePark Holdings may not possess the mainstream and illustrious history that Sony and in particular Nintendo have. To consider the GP2X as a replacement or incremental upgrade to your PSP or DS would be wrong as its targeting a relative niche within the market. With this being said, the sheer power and open-source concept of the product opens up a wealth of originality and longevity of the console which the PSP and DS can only dream of in their original form. We’re talking perfect emulation of retro consoles and perhaps first generation consoles such as the PSX and N64 in the near future, masses of neat little utilities and not to mention a fully featured portable media player playing back every popular image and movie format right out of the box. You will not need a mod, a firmware hack or anything of the sort, all you will need is this console and an SD memory card in order to be within reach of a huge array of functionality in your hands whenever and wherever you like. You will not have the likes of world renowned development houses such as Ubisoft and Electronic Arts pumping out titles for this console, but what you will have is a talented and exciting homebrew community pushing out innovative and exciting developments which are sure not to leave you feeling blue. There is even an inbuilt TV-Out for this console, so you can play all your video and emulation files on the big screen with no fuss and in great quality. The GP2X is by no means bureaucratically motivated and ultimately aims to please you, the end user. Despite all this talk of operating systems and various file formats, it really would be usable by virtually anyone who has a little know how and motivation, perhaps even you’re Grandma, as the menus are that intuitive! If you want to relive the good old days in the palm of your hands, complete with support for modern media technology such as no fuss audio and movie playback then the GP2X is right for you. To put it simply, a delightfully made and limitless hand-held console which fires on all cylinders!